Today November 30, I share to the world the collective vision of a city that aspires for change. I chose the call “ONE Bacolod” to symbolize that we have one city, and we all share one dream for our city – to make it the city we can all be truly proud of. I have committed to become the voice of this dream. I will reach out to every Bacolodnon to listen to them, to understand their aspirations and get their ideas – so I can become an effective voice for Bacolod. As I enter one of the most crucial challenges in my life – running for the mayor of the City of Bacolod – I consider this an important reckoning – an opportunity to assess the person you see in the mirror. I ask myself the most important question today – what is my brand of leadership as the highest leader of a city? What does it mean when we say Jocelle Batapa Sigue leadership? I reflect upon my life as a leader since I was 6, and president of my first grader class until today as I review my curriculum vitae. I see many accomplishments and milestones – but then I still have to go back to the question – so what is it a Jocelle Batapa Sigue brand of leadership? For me, leadership is not a position. It is a responsibility. It is beyond the title, it is what you are set to accomplish using the title you hold. 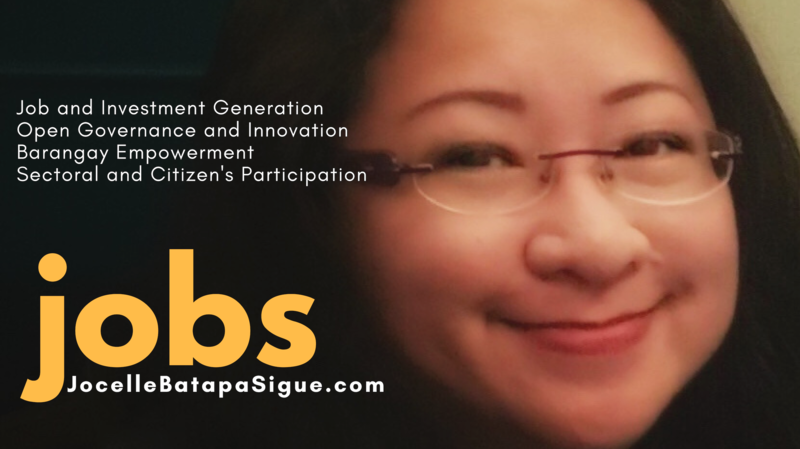 To easily remember the four basic tenets I follow – I will use my tagline – a branding I have used since my second term as councilor sometime in 2007, or around ten years already – JOBS. Jobs, because I was serious in dedicating myself to the cause of creating information and communications technology (ICT) jobs since my first term began in 2004. That is a long story which is already amply covered by many materials available in the Internet. Creating opportunities for Bacolod in the ICT industry has become not only a committee responsibility since I took on the task s Sanggunian Panlugsod chair of communications and energy in 2004 – but has become an advocacy, a life-long passion until today. Now JOBS is going beyond just its literal meaning and the fact that it is my initials JO from my first name and B for Batapa and S for Sigue. Talent Development Roadmap for Bacolod which entails a comprehensive summary and analysis of our available skills in the city across all industries (not just ICT) focused on skilling, upskilling and re-skilling the talent supply, a clear and time-bound set of strategies to develop digital skills across all sectors to prepare the talent pool for the Future of Work, a continuous series of T3s (train the trainers/train the teachers) programs to ensure quality and scale of educational and training programs. Business Environment, Infrastructure, Cost and Ease of Doing Business which are all indicators for the attractiveness of location to the influx of digital jobs or ICT-enabled employment opportunities and entrepreneurial ventures or startups. A mandatory compliance to the provisions of the new Ease of Doing Business law is going to be the first order of the day. There is a need to actively involve the business and private sector in addressing all current bottlenecks like energy supply, peace and order, traffic management, solid waste management and other environmental issues. A strong collaboration between the city and the business sector will serve as a mechanism to identify more relevant strategies along the way and allow for future and long-term planning. Business and Investment Promotions and the need to institutionalize programs to constantly develop investment campaigns for Bacolod across identified potential industries is also in the forefront of my plans. O is for Open Governance. A policy direction that is very close to my heart, as a systems thinker, I see the importance of bringing government closer to the people – as way of not only securing valuable feedback but a way to constantly gather ideas and solutions. Under the concept of an OPEN Bacolod – I have four basic items that spells OPEN. O for online, real-time easy access of every citizen to facts, data and figures pertaining to the operations, finances and administration of the city. These will entail for all data to be digitized and made available to the public. The use of online procurement system, business permit registration and registration and licensing for other departments and other transactions shall pass from experimental to full operation stage in the soonest possible time. P is performance scorecards and ratings for public services. In order to ensure and maintain the quality of government services, feedback mechanisms that comes with ratings for each department of the city shall be in place. Top performing agencies shall be duly commended while those with concerns will have to be revisited and improved for efficiency. We shall bring back the trust and confidence of the public for all department of the city and strive to uplift the moral of public employees through incentive program and continuous trainings. E is for emergency and immediate support services. The website of Bacolod shall not be static but interactive and hotlines for citizen’s concerns shall be in place. The website shall be fully accessible especially through mobile. The city shall ensure availability of Internet/wi-fi hotspots in major public areas for use during emergency. Closed circuit TV systems, and GPS and other technologies shall be used to ensure 24/7 safety in the city. A well-established central command shall be in place with the mayor having 24/7 direct access and full view of all cameras in major public places. Sensors and other technologies shall also be put in place to detect flood water rise and other calamities. Frontline service providers like social workers, barangay health workers, child development workers and other barangay level personnel having direct access and ability to gather data directly from the source shall be equiped with platforms and systems to input data real-time to make all city-wide data updated and useful for policy formulation and immediate and relevant action from the city. N is for new ideas and solutions crowdsourcing. Open governance extends to policy innovation – creating a way to effectively crowd source new ideas and solutions from concerned groups. The city will support the development of startups engaged in developing and deploying technologies which may prove useful for Bacolod to become a smart city – with focus on major points such as transportation, healthcare, business, public services, education, and tourism. OPEN Governance shall mean investing in available and reasonably priced technology, preferably open source, universal, and replicable technology to boost the eGovernance initiatives of Bacolod. B is for Barangay Development and Empowerment. Under my leadership, I shall empower the barangays to really create significant impact on their constituency through effective power sharing and sharing of resources. The barangays shall be in the frontline of effectively addressing and managing solid waste, all forms of pollution, transportation matters and peace and order within their area of jurisdiction with the full support of the city in terms of resources and technical guidance. Continuous training and development of barangay officials including Sanggunian Kabataan officials shall be a priority of the city. Productive dialogue and consultations between the mayor’s office and the barangays shall take place regularly to ensure collaboration. S is for Sectoral Participation and Policy Innovation. Most important ingredient of my leadership is consensus building – a brand of governance that is participatory and consultative. To address concerns and issues in a relevant and responsive way by engaging and empowering the concerned sectors to develop solutions for themselves. The city shall empower each major sector to have access to information and opportunities to raise their concerns to the city – these include informal sector workers such as farmers, fisherfolks, drivers, construction workers, vendors, professionals, teachers, senior citizens, women and children’s groups, PWDs, LGBTs, minorities and many more. By creating a participatory and consultative environment, I will ensure that under my leadership – respect for the independence of the Sangguniang Panlungsod is observed. My leadership shall be the start of an era for Policy Innovation. As a former councilor for nine years, I have only my deepest respect for the Sanggunian as an institution and a co-equal body to the executive. Regardless of political affiliations, my leadership will work closely and harmoniously with all elected councilors especially on their concerns as committee chairs. I will objectively collaborate with the Sanggunian in achieving proper implementation of all existing ordinances that are aligned with the urgent needs of the people and direction of my leadership. Under my leadership, the city government shall closely listen to the needs of the people. The top concerns of citizes of Bacolod today are traffic and traffic-related concerns, garbage or waste management and street lights and road maintenance. Here is a snapshot of a social media survey conducted by a site called “TagaBacolod”. The post got almost 500 comments but some appeared to have been filtered maybe due to its unsuitability for public view or being irrelevant. We cannot continue to be complacent long enough. The real problem of this city is our kind of leaders. Leaders who love to lip service without clear vision. “Pang-masa” – a strategy that has been terribly, so pitifully exploited and abused by all traditional politicians in this country! I am not going to fool the so-called “masa” with promises. 5. A city hospital with comprehensive e-healthcards for our poor citizens	⁃	a full suite of solid waste policy and programs leading to the zero-waste objectives of Ra 9003 – composed of well mantained MRFs down to the barangay level, waste to energy and waste to fertilizer or waste to concrete blocs technology, tarment plant for hazardous wastes, buy-back centers for recylable waste, paper plants and all types of process to achieve zero waste and regulate and lessen landfill use. Aside from the things above, I am sure there are many things we need to do and that needs to be done. Soon the debates will start, and I pray that the people of Bacolod will be with me in this journey towards creating a brigther future for Bacolod. very good good suggestion. as mentioned in some of my other writeups. i wish to start a sport development fund to support junior athletes.